As more violence erupts in Xinjiang, Beijing and Uyghur activists fight to control the narrative. Reports from Tianshan, the Xinjiang government’s news service, indicate that 16 people died during an incident in Xinjiang late Sunday night. According to the report, Chinese police were in Shufu County, in the Kashgar region, seeking to apprehend unnamed criminal suspects. The police force was then attacked by rioters throwing homemade explosives and wielding machetes. According to the report, the rioters killed two policemen, and then police opened fire, killing 14. Two unnamed suspects were arrested after the incident. When asked about the attack, Foreign Ministry Spokeswoman Hua Chunying said that China is a country ruled by law, with a responsibility to fight crime and protect citizen’s lives and the security of their property. As for the specific incident in Kashgar, Hua said that the Chinese security forces had defeated a “violent terror gang.” The rioters’ attack, she added, should receive international condemnation. Violent terrorists’ plots to destroy Xinjiang’s economy, social stability and ethnic cooperation will not succeed, she said. Kashgar, located around 50 miles from the Kyrgyzstan border in far-western Xinjiang, has been the site of violence before. According to the South China Morning Post, counting Sunday’s violence there have been four incidents in Kashgar this year alone, with a total of 64 dead. 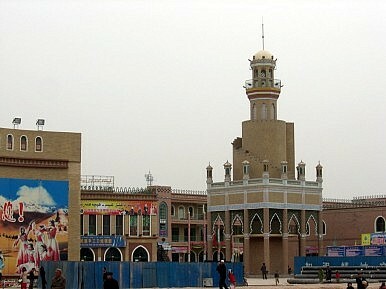 Kashgar was previously the site of a 2008 attack that killed 16 policemen. During that attack, assailants threw homemade explosives at policemen during their regular morning drills. China blamed the attack on the East Turkestan Islamic Movement, a Uyghur-separatist terrorist group that was reportedly encouraging terrorist attacks in the run-up to the Beijing Olympics. The ETIM’s successor, the Turkestan Islamic Party, claimed responsibility for a car crash in Tiananmen Square in October of this year. The crash killed five people and injured 40. In the aftermath, many Uyghurs activists worried that the incident would spark a crackdown on Xinjiang’s Uyghur population. Such activists reject Beijing’s claim that there are organized terrorists groups operating in Xinjiang. Rebiya Kadeer, President of the World Uyghur Congress, recently told The Diplomat that “there is absolutely no organized terrorist threat” in Xinjiang. In a statement released regarding the latest incident in Kashgar, the World Uyghur Congress “strongly condemns the shooting and killing of 14 Uyghur demonstrators, including those of two teenagers.” The WUC’s reading of the situation was vastly different than the official Chinese media version, claiming that demonstrators “were killed due to indiscriminate shooting by the security forces.” There is no mention of any attack on Chinese police forces. There’s a stark difference between this narrative and the Chinese media version of an armed attack by rioters. Unfortunately, if past incidents are any guide, we’re unlikely to get any clarification. Updates on violence in Xinjiang generally come from one of two sources: official Chinese media reports or foreign-based Uyghur activists groups. Both sides have their biases. Unfortunately, China’s intense restrictions on journalist activity in Xinjiang makes it impossible for other sources to verify statement by either side. So far, the only thing both Beijing and Uyghur activists seem to agree on is that the violence is likely to continue. With the G20 leaders focused on terrorism after the attacks in Paris, China wants help in its fight against ETIM.